DLF Emporio, India’s first and finest luxury destination celebrated the spirit of womanhood on the occasion of International Women's Day, on 4th March 2016. Observed annually on March 8, the International Women’s Day is commemorated to celebrate and appreciate women from all walks of life for their achievements. DLF Emporio was held at Terraze, SET’Z Bar & Restaurant, where women from fashion, corporate and media were seen enjoying their day. The quintessential afternoon witnessed guests indulging in various pampering and rejuvenating sessions such as nail art by 1010 Nail Spa, make up, hair styling, head and shoulder massage by Magnifique salon, foot and hand reflexology by Worship Salon followed by delectable beverages by Typhoo Tea and a lavish buffet spread by SET’Z Bar & Restaurant. The event concluded with a collective salutation to the resilient spirit of women and a nod to the courageousness and strength of all the guests present at the celebrations. 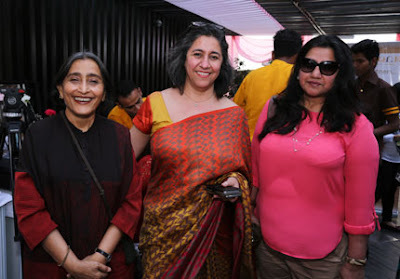 Renowned guests seen at the event included Designer Leena Singh, Sama and Meera Muzaffar Ali, Mrs Ritu Khattar wife of CEO DLF Group & Rentco Business, Entrepreneur Shalini Arora Kocchar,Shilu Kumar Owner of Pashma, Actress/Yoga Expert Neesha Singh, Designer Neeru kumar, Guneeta Kapoor, Owner of Kapoor watch & Co.
DLF Emporio houses seventy-four International Labels and one hundred and eleven Indian designers, DLF Emporio is truly the finest luxury destination in India and a trendsetter of its kind. From the largest collection of International menswear, women’s designer and childrens Fashion, both ethnic and International, bags and accessories, Jewellery and Watches, to Home and Lifestyle products, DLF Emporio is truly a shopper’s paradise. DLF Emporio, has been conceptualized and designed with the sole purpose of simply offering sheer luxury shopping experience for its esteemed customers. DLF Emporio follows an uber-chic design concept with a décor in shades of gold and copper that lends it a grand look.